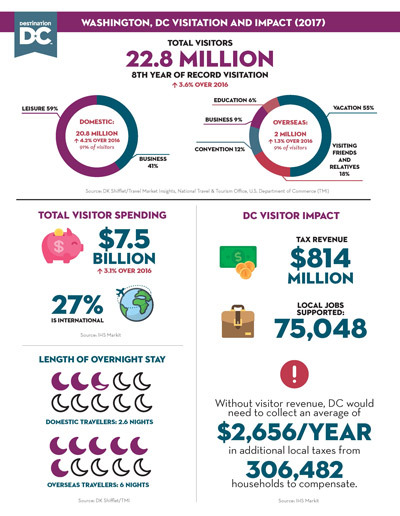 Destination DC releases key tourism facts and figures annually. See the latest research below. The following documents provide additional and historical information about the Washington, DC hospitality industry. Please note that our statistics are released annually; full 2018 data will be published in Fall 2019. Check out the 2017 visitor fact sheet. Smithsonian Institution: for visitor statistics at the member museums of the Smithsonian Institution. Greater Washington Initiative: for demographic information about DC and statistics about its major industries. Washington, DC Economic Partnership: for additional DC democratic and economic development facts & figures.